For the cell phone, see BlackBerry. Blackberry fruits on the bush. The blackberry is an edible fruit made by any of several species in the Rubus genus of the Rosaceae family. 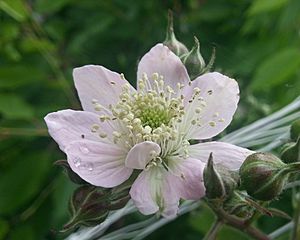 The blackberry shrub is called "bramble" in Britain, but in the western U.S. "caneberry" is the term is used for both blackberries and raspberries. It is a widespread and well known group of over 375 species which reproduce by apomixis. They are native all over the temperate Northern hemisphere and South America. The blackberry grows to about 3 m in height. It makes an edible black fruit, known by the same name. The plant tolerates poor soil very well. The plant down its strong suckering roots amongst garden hedges and shrubs. It will grow fast, taking over uncultivated spots very quickly. In some parts of the world, such as in Australia, Chile, New Zealand, and the Pacific Northwest of North America, some blackberry species are regarded as weeds. What distinguishes the blackberry from its raspberry relatives is whether or not the torus (receptacle or stem) "picks with" (i.e., stays with) the fruit. When one picks a blackberry fruit, the torus does stay with the fruit. With a raspberry, the torus remains on the plant, leaving a hollow core in the raspberry fruit. 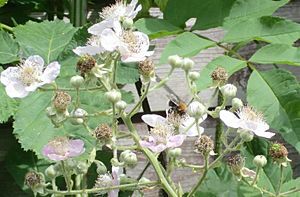 The term bramble, a word meaning any impenetrable thicket, has traditionally been applied specifically to the blackberry or its products, though in the United States it applies to all members of the Rubus genus. In the western US, the term caneberry is used to refer to blackberries and raspberries as a group rather than the term bramble. As there is evidence from the Iron Age Haraldskær Woman that she consumed blackberries some 2500 years ago, it is reasonable to conclude that blackberries have been eaten by humans over thousands of years. American cultivated blackberries (R. laciniatus and R. ursinus) are notable for their significant contents of dietary fiber, vitamin C, and vitamin K (table). A 100 gram serving of raw blackberries supplies 43 calories and 5 grams of dietary fiber or 25% of the recommended Daily Value (DV) (table). In 100 grams, vitamin C and vitamin K contents are 25% and 19% DV, respectively, while other essential nutrients are low in content (table). Blackberries rank highly among fruits for in vitro antioxidant strength, particularly because of their dense content of polyphenolic compounds, such as ellagic acid, tannins, ellagitannins, quercetin, gallic acid, anthocyanins, and cyanidins. One report placed blackberry at the top of more than 1000 polyphenol-rich foods consumed in the United States, but this concept of a health benefit from consuming darkly colored foods like blackberries remains scientifically unverified and not accepted for health claims on food labels. 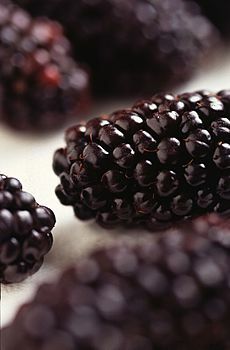 Worldwide, Mexico is the leading producer of blackberries, with nearly the entire crop being produced for export into the off-season fresh markets in North America and Europe. The Mexican market is almost entirely from the cultivar 'Tupy' (often spelled 'Tupi', but the EMBRAPA program in Brazil from which it was released prefers the 'Tupy' spelling). In the US, Oregon is the leading commercial blackberry producer, producing 42.6 million pounds on 6,180 acres (25.0 km2), in 1995 and 56.1 million pounds on 7,000 acres (28 km2) in 2009. Because blackberries belong to the same genus as raspberries, they share the same diseases including anthracnose which can cause the berry to have uneven ripening and sap flow may also be slowed. They also share the same remedies including the Bordeaux mixture, a combination of lime, water and copper(II) sulfate. The rows between blackberry plants must be free of weeds, blackberry suckers and grasses which may lead to pests or diseases. 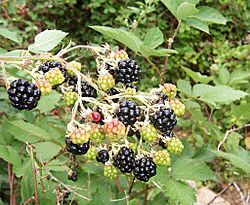 Fruit growers are selective when planting blackberry bushes as wild blackberries may be infected and gardeners are recommended to purchase only certified disease-free plants. The spotted-wing drosophila, Drosophila suzukii, is a serious pest of blackberries. Unlike its vinegar fly relatives which are primarily attracted to rotting or fermented fruit, D. suzukii attacks fresh, ripe fruit by laying eggs under the soft skin. The larvae hatch and grow in the fruit, destroying the fruit's commercial value. Another pest is Amphorophora rubi, known as the blackberry aphid, which eats not only blackberries but raspberries as well. Blackberry Facts for Kids. Kiddle Encyclopedia.